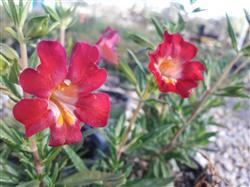 Trish Monkeyflower is a cultivar of the Bush Monkeyflower (Mimulus aurantiacus), a small 1 to 2 foot high shrub with a 2 to 3 foot spread. The foliage is deep green with a slightly sticky feel. The Trish variety sports profuse dusky rose-pink flowers that fade to salmon. These plants flower in early spring inland and can bloom almost year-round on the coast, especially if you take the time to deadhead and encourage more flowering. Best in sun on the coast and in part shade inland where drainage is good and summer water is provided sparingly. It is a favorite for both hummingbirds and butterflies.